Auto Sorting Memory: Sorts all stored stations according to frequency and removes duplicate station frequencies. 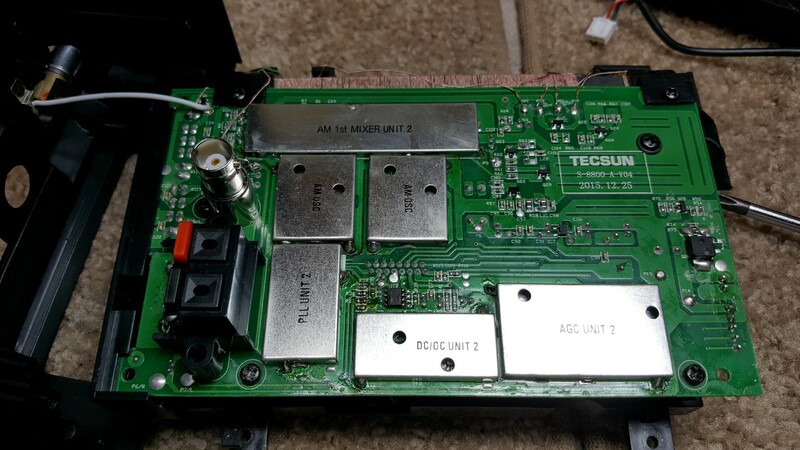 Initial Observations: There was certainly a lot to take in after checking this long list of features and specs and I will say that Tecsun has produced one of the best owner’s manuals I have seen in a long time. Luckily the S-8800 is intuitive enough to use right out of the box but I did have to check a few things in the manual to get set up. As always, I did end up reading the entire booklet…you will certainly miss a few details if you don’t. Always read the manual! 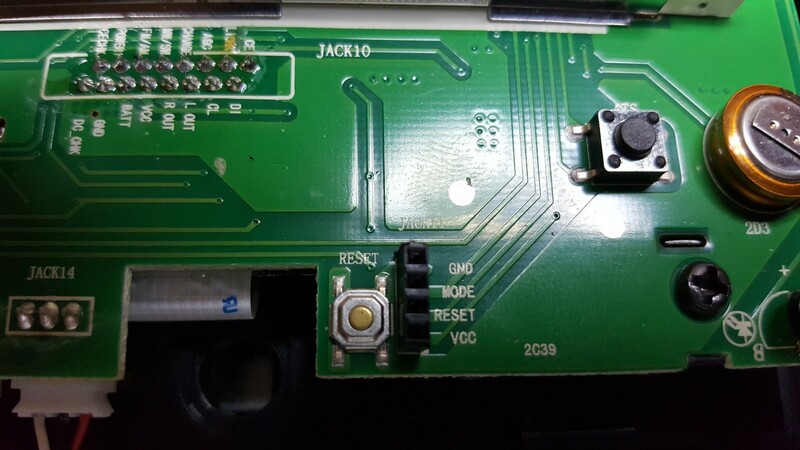 For example, you would never know to look under the Tuning Knob to find the reset button, or the function of the two Test LED’s in the battery compartment. And of course, there are other functions you won’t know about without the checking the manual. You can download the manual online. 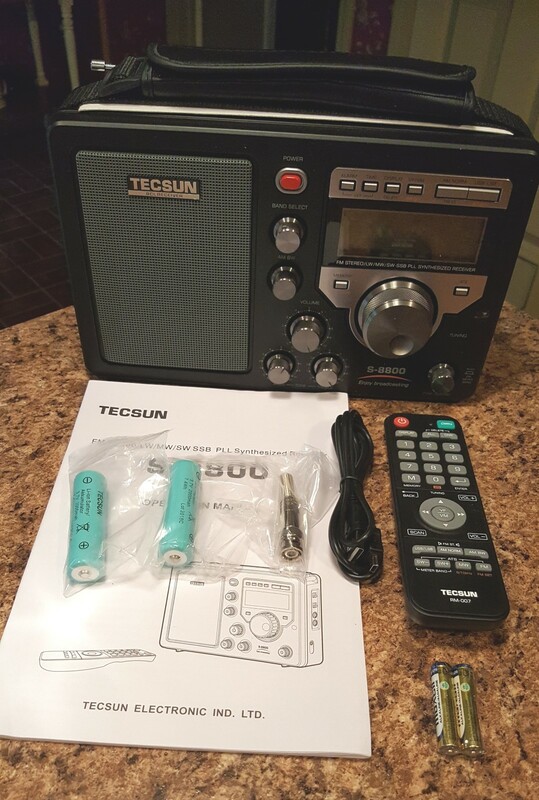 I find it interesting that Tecsun chose to build this sophisticated new radio into the same cabinet as the now vintage BCL-2000/BCL-3000 radios which were also sold under many other names such as the Eton/Grundig S-350 series. Not that there is anything wrong with this design – quite the contrary. This form factor is both familiar and convenient and has become very popular as the so-called “Field Radio” design which was reinvigorated when the BCL-2000 was introduced back in 2004. My only concern whatsoever is that the resemblance is only skin deep…the new S-8800 is a far more sophisticated, much higher performing radio in many ways and I want people to know it shares nothing other than outward appearance with those earlier designs which, while they were high “fun factor” radios, suffered severe image and drift problems which are completely non-existent in this new model. The S-8800 ships with a standard USB to USB mini-B cable which can be plugged into a PC or USB charger – no AC charger is supplied. The specs call for a 1A charger. While this might be considered a negative, most of us have collected several USB chargers and I found an old cell phone USB charger rated at 1 amp output which charged the batteries fully in a few hours. Check the label on your USB charger though because I have some labelled 500 ma and one is even lower. Any standard USB power source should work fine of course, although some may require a longer charge time. I connected the radio to my USB-2 equipped PC and found it took about 4:15 to do a full charge. Left- BCL-2000 Circa 2004 – Right S-8800 Similar on the outside – inside a totally re-designed, superior radio. 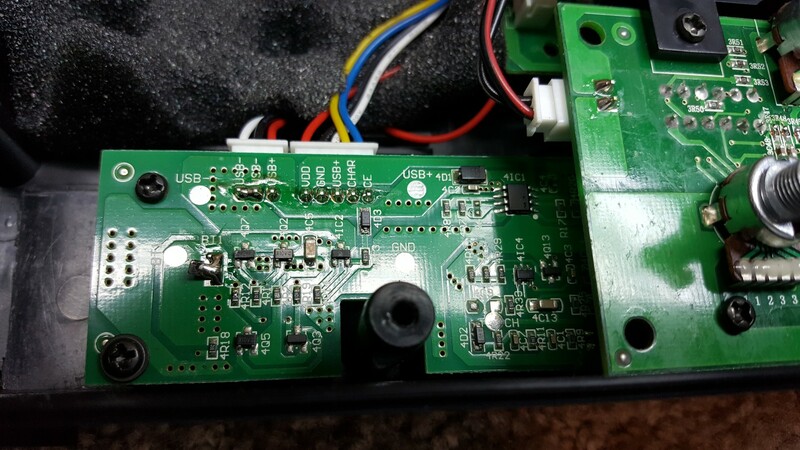 Hybrid DSP/PLL Analog Design/A Look Inside: The main PCB is dated 2015 12 27 which gives an indication of how long this radio has been in development. The S-8800 boasts Triple Conversion on SW which pretty much guarantees that there will be no image problems here and indeed I observed none during my tests. 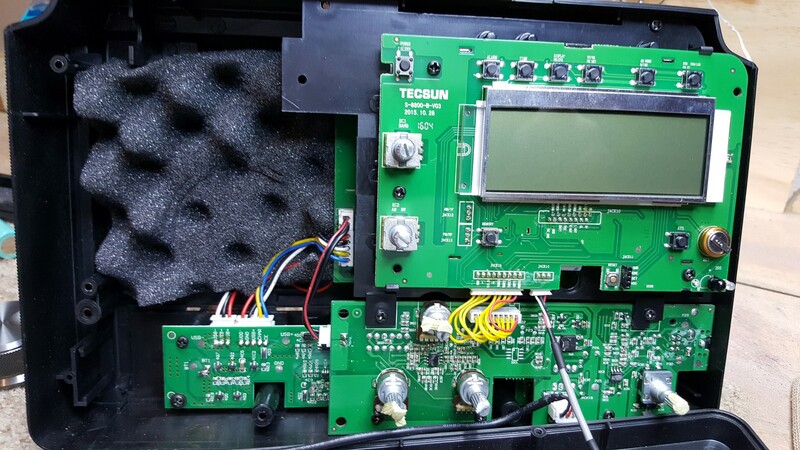 Tecsun has decided to utilize a combination of DSP (Digital Signal Processing) circuits along with traditional analog circuits but it took some digging to see where DSP is used. I took a look inside and discovered that the AM/SW contains both types. Looking at these pictures along with the specs given in the manual we see that most of the AM/SW circuitry is PLL/analog along with the 1st and 2nd IF’s, while the 3rd IF is DSP. All appear to be well-shielded and labeled and construction quality looks very good. 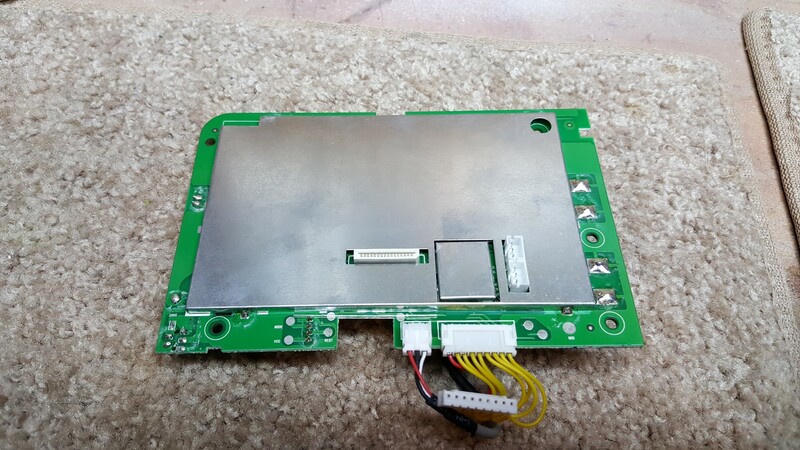 I did not locate the DSP chip and decided not to remove any of the shield covers to do so. The FM would appear to be DSP and my performance tests seem to back up that assumption. The remote control is perhaps the most unusual and welcome feature. It not only adds direct entry of frequency which has been lacking in other Field radios but allows almost all of the radio’s functions to be controlled, from band and bandwidth selection to fast/slow tuning, memory functions, SSB mode, volume and much more. You can also set the display backlight to be “On” whenever the radio is on by pressing the number 3 while the radio is off until the word “On” appears on the display…a great feature. About the only functions you can’t control are bass and treble adjustment, time/alarm setting and master volume. To explain that, what I’m calling the “Master Volume” is the knob on the radio itself. You initially set it to maximum or whatever volume you feel is the loudest you will ever use, say, the one o’clock position, then the remote allows you to reduce that volume down to zero in 30 steps – it reads out on the display from 30-0. Both the radio itself and the remote have a nice, solid feel. Tuning via the knobs is silky smooth and the ability to switch from the main tuning knob which tunes in fast increments to the smaller fine-tuning knob which tunes slowly and continuously allows excellent flexibility for band scanning and fine tuning with no muting…thank you! You can also fast or slow tune with the remote which has dedicated Fast and Slow tune buttons…Tecsun got this right. This radio is wonderful to tune offering the perfect analog feel along with digital precision. In fact, during my tests I compared the S-8800 with my C. Crane CC-SW and Eton Field 550 and now that we have a Field radio with a keypad and direct frequency entry I found it frustrating trying to change frequencies quickly on the two older models…the Tecsun is just so quick and easy by comparison. Another plus is that there is also none of the dreaded Soft Muting which plagues so many otherwise good radios. Soft Muting is a feature of many DSP chips which attempts to reduce noise between stations but in use tends to undo the benefits of AGC (Automatic Gain Control) and to produce unwanted volume surging and muting. Again, it is completely non-existent in the S-8800. Yay! Power Standby Mode: One point explained in the manual is that you must initially turn the radio on using the Power button on the radio itself. After that you can turn it on or off with the remote control, but if you leave the radio off for an hour the radio shuts down entirely and will have to once again be turned on by the front panel Power button. This is unavoidable in a battery-powered portable. Standby mode – the ability to receive signals from the remote – uses battery power. If the radio stayed in standby mode the battery would be drained so it can’t remain on permanently as it is in AC powered devices. In use I didn’t find this much of a drawback. Let’s face it…the fact that the S-8800 even has a remote sets it apart from other portables and this is a small price to pay. One idea Tecsun might want to consider though is adding a way to dock that remote, perhaps on the back of the radio. I will probably do this with Velcro so when carrying the radio about I don’t have to carry two items with me. Just an idea…. 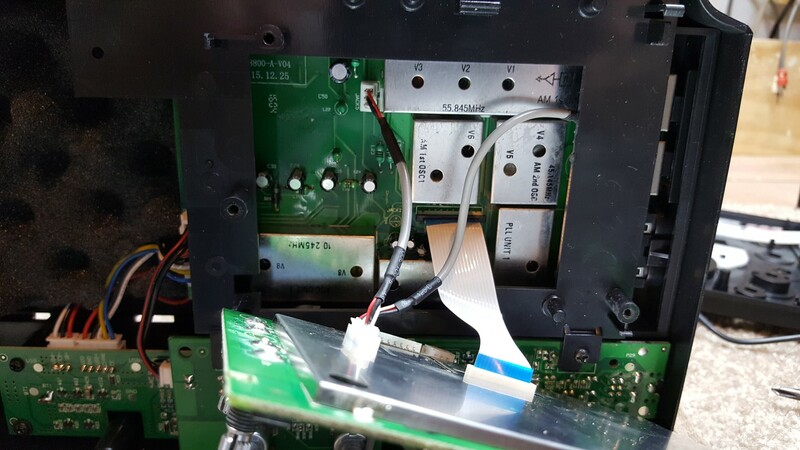 No Synchronous Detection: I must admit it is hard to understand why sync was not an included feature, especially since Tecsun has an effective sync circuit in its PL-660/PL-680 models. 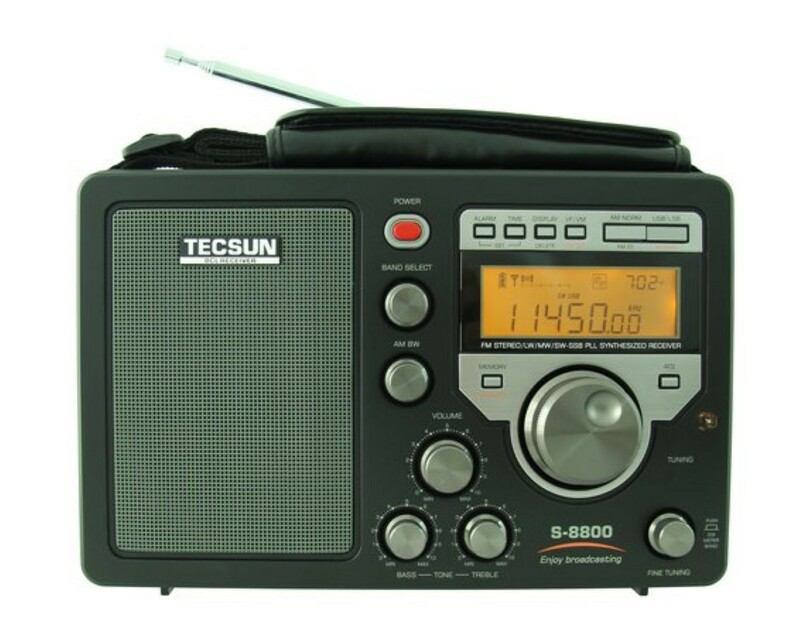 But sync is an on-again/off-again thing with Tecsun since it is not present in their S-2000/Satellit 750 and is less-than-ideal as deployed in the otherwise very nice PL-880. While lack of sync is not a game-ender for me, it does seem it should have been included in a receiver so replete with just about every other desirable feature one can think of and a few others we hadn’t thought of. 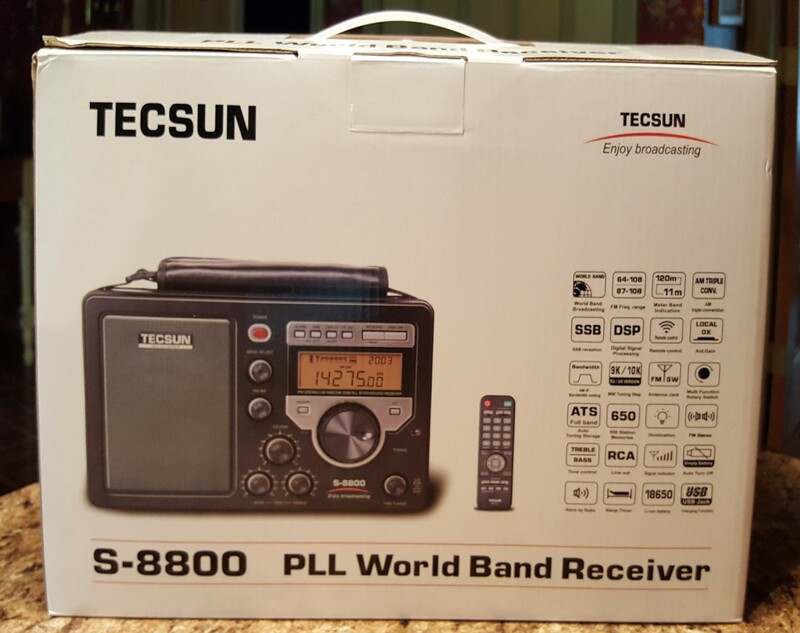 The reality is that the S-8800’s AM performance, while not quite achieving 4 or 5 star performance is slightly better than any other Tecsun currently available, ranking *** in the AM Mega List. Although it is reasonably sensitive, weak and medium strength AM signals have a bit more background circuit hiss than any of the **** to ***** radios. Of course, a small loop or external antenna improves this markedly. The S-8800 also seemed to excel at impulse noise rejection which is one area in which many modern radios perform well. I turned on a window fan which generates a bit of static and noticed that the S-8800 seemed to ignore that noise better than several older radios I compared it with. Birdies – A Moving Target: Initial reviews revealed the presence of several birdies on AM and SW…internally generated noises that can mar reception on certain frequencies. Later reports indicated these may have been somewhat mitigated but unfortunately my sample has them. I tuned slowly across the entire AM band and found six birdies…most were het-like tones but one was a seemingly dead carrier, which gave full signal meter reading but no sound. But oddly, the next day when I tried to verify their frequencies they had all shifted higher in frequency. As an example, the first birdie I found covered frequencies from 558 – 565 KHz, and could be heard behind a semi-local station on 560. But the next day I found that 560 was clear…no birdie, so I scanned slowly and found this birdie had moved to a range between 565-574 KHz. The third time I checked it was now 567-577 KHz. I think this drift of the birdies was caused by changes in temperature. Possibly, battery voltage plays a part as well, although I think that Li-ion batteries put out a fairly constant voltage over most of their discharge range. I may be lucky but it seems those birdies seldom bother the stations I listen to most often but if one happens to exist on a frequency that’s important to you it might be hard to live with. And even if not, I would sure be happier for general band scanning if they were not there. Such birdies have no place in an expensive receiver and is the biggest negative I have to report. 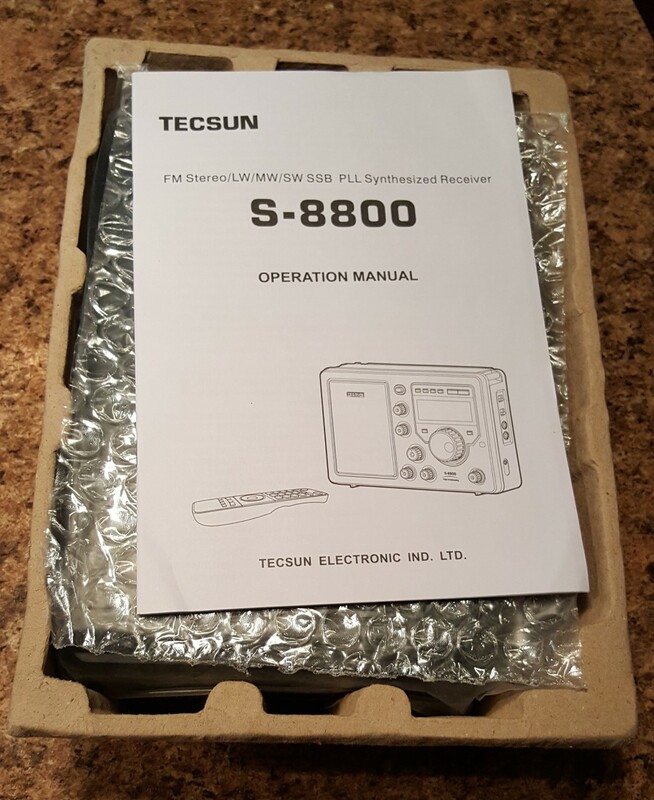 I hope Tecsun will address this issue and remove the only real weakness of the S-8800’s performance and I challenge them to do so. LW: I am not in an area where there is much to hear on LW except for DX’ing but there are some utility signals I can receive and the S-8800 seemed to hear them just fine compared with a few other radios I compared it with. I would say it seemed pretty good on LW but will leave more precise LW reports to others. SW Performance was excellent. This radio features Triple Conversion on SW which results in none of the images which plagued the earlier BCL series radios. Using the whip antenna, I did several daytime band scans comparing the S-8800 side by side with several familiar radios including the Tecsun S-2000/Grundig Satellit 750, the Tecsun PL-880, PL-660, Eton/Grundig Satellit Executive, the Eton Field 550 and BT and a Sony ICF-7600GR. The S-8800 matched or beat them overall…it always held its own against the competition and here and there it was just slightly better. I would say it is as good as it gets in a currently-made portable radio for SW reception. I also tried SSB mode with great results. It was very easy to tune for natural audio, even from the remote; the fact that the Fine-Tuning knob and the Fine Tuning on the remote are continuous makes it very easy to tune SSB. You only have to get close enough to hear the signal with the Main Tuning Knob or Fast Tuning on the remote, then rotate the Fine Tuning or use the Slow Tuning on the remote until you’re there. SSB reception was stable with good AGC characteristics that did not create unnatural surging or distortion and it was very easy to tune for best audio. Occasionally, shortening the whip or using the Local switch position made for clearer SSB reception of stronger signals. I was not bothered by any birdies on SW…the S-8800 should delight SW listeners. FM Performance was also excellent, rating Five Stars on the FM Mega Shootout list. Selectivity was superb as with most of today’s DSP FM tuners – the S-8800 had no trouble separating closely packed stations on the dial, and sensitivity to very weak FM signals was excellent. Capture ratio also competed with my best reference radios…many frequencies revealing multiple stations that could be received by reorienting the whip antenna or moving the radio. The S-8800 ran with the best in these tests. External Antennas: The S-8800 has a BNC jack for a low impedance SW or FM antenna and spring clips for a high impedance AM antenna. You cannot disable the internal ferrite rod AM antenna. I first compared the Tecsun with my reference Grundig Satellit 800 and Eton E1 connected to my Wellbrook ALA-330S amplified loop. 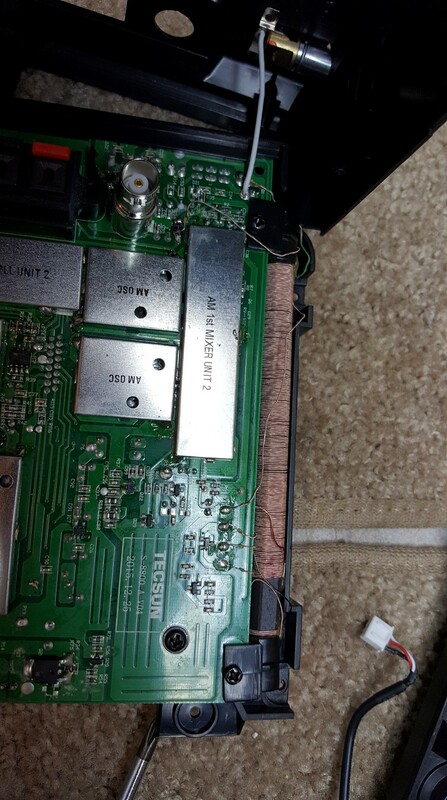 This caused a slight logistics problem because I use the Wellbrook for AM and SW and with the S-8800 this required a different connection for each mode. 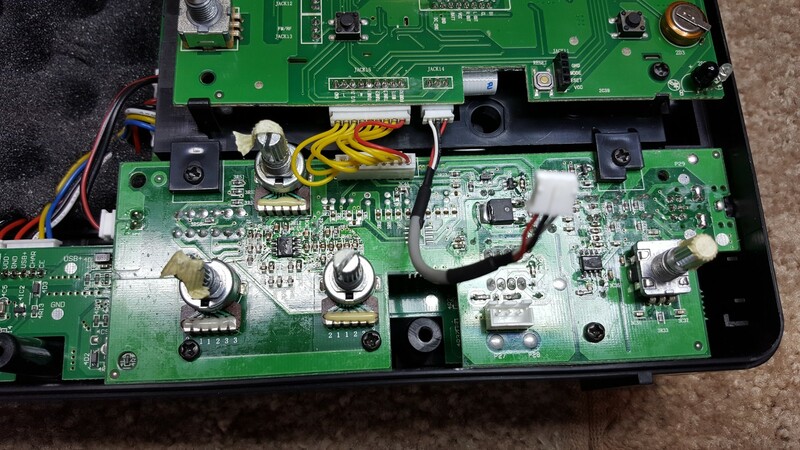 I ended up using an A/B switch to alternately connect the antenna to either of the S-8800’s inputs and this worked fine. The S-8800 performed wonderfully with the external antenna and although it did not quite match the more sophisticated reference radios on a few faint signals, it performed just as well on most of things I could receive and it was as good or better than any current portable in this test which is great performance. There were some signs of SW overload at night as on most of the other portables but the Local/DX switch completely eliminated it. I also used an attic-mounted FM antenna and the S-8800 worked well with it – the antenna gave a boost in reception over the whip on FM on many signals but since the attic antenna is omni-directional some signals were better with the whip since I could adjust it for them. In my location the whip antenna brings me all I need – for a more serious FM antenna one would need a directional antenna and a rotor. Sound Quality was good. In general, these Field radios (large lunchbox size) have pleasing audio. The sound is a bit on the mellow side but I think most people will like the nicely balanced, powerful sound you will get from the S-8800. You can listen to it all day without fatigue. One last point is that the Battery Meter gives a good idea of how much charge is remaining…it drops from Full to Empty very gradually. During my testing period I used the radio for several hours each day and generally got three days between charges…you may get several more if you only use it an hour or two each day. It was always clear how much more life was left before the next charge was needed. Conclusion: The Tecsun S-8800 is a worthy contender in the Field Radio (aka Lunchbox-sized) arena. Is it perfect? No. But what radio is? For example, the Eton Field BT has slightly crisper audio, but very weak AM reception at the top of the band, and no keypad for direct frequency entry. The sadly discontinued Redsun RP-2100/C. Crane CC-SW also have strong audio, but again, no keypad and they don’t tune as much like an analog radio as the Tecsun does. Of course, neither has remote control nor the S-8800’s huge list of features. 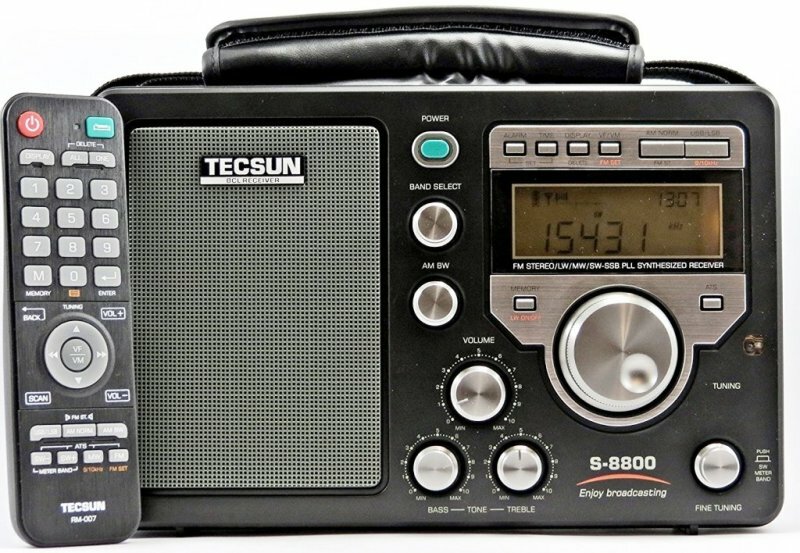 Even Tecsun’s S-2000/Eton/Grundig Satellit 750 do not match the S-8800 on AM, nor do they tune as smoothly and nicely as the S-8800 which also boasts more sophisticated, more symmetrical IF filters. In other words, although I hope the birdie issue will be resolved, and I also hope that someday Tecsun will be able to build an AM tuner that can compete with Four and Five Star AM radios such as the C. Crane CC-2E, CC-EP, or some or our favorite vintage radios, there is nevertheless a lot to like about the Tecsun S-8800. It has a long list of superiorities along with features available on few if any other radios. As for the birdies I plan to stay on top of this and will report if and when it has been resolved. 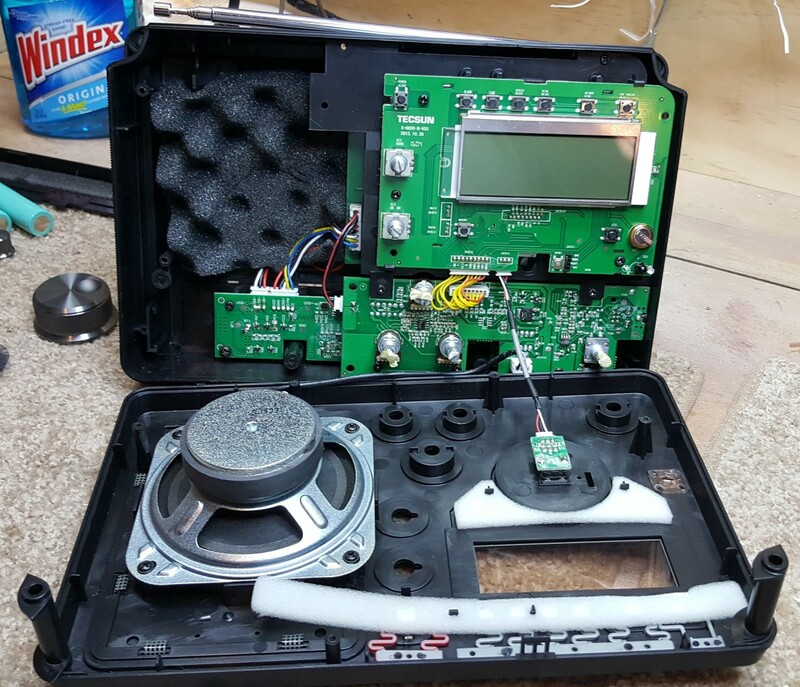 The original Eton Field 550 radio had a severe birdie issue which I resolved by adding a simple metal shield which had been omitted from the design and I demonstrated this in the Field 550 review. Shortly thereafter Eton added the shield into production and the defect was remedied. 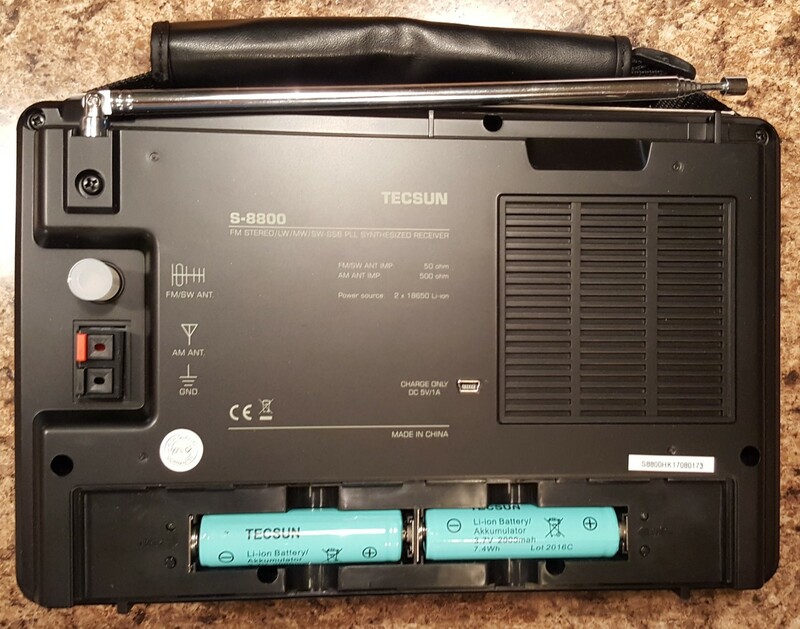 Whether more shielding or something else is needed, surely Tecsun has the ability to find the solution for the otherwise excellent S-8800…let’s hope they do!